Hello, Ian, just a note. The next time you and your friends make an instructional video, I think a Merlin robe and hat should considered. For you to take us to all of the dark corners and scary places and, provide enlightenment and confidence is nothing, if not magical! I was hoping that your program would help on a project that has just begun,…..it has done far more than that!….. I have started on a gas (petrol) 135 Deluxe ‘68, and, another complete rebuild of a diesel MF20 w/ loader, and back hoe ‘71, if all goes well. Thank you for your good work! This one is from Pierre (France). We have been emailing with Pierre (who only speaks French), so we’ve had to go to Google Translate to try and understand each other. Anyway, Pierre eventually put his order through for the MF35 DVD’s (Hydrualics and 4 Cylinder Engine Rebuild) and then wrote back to say…. J’ai bien reçu mes deux DVD ;je les regarde en ce momment , superbe! au revoir Pierre. Google says this translates to :- I received my two DVD’s, I watch at the moment, superb! I’ve finally fitted the 23cs to my boat and both engines fired up first time!! My background is in carpentry, although I now teach English in the local prison, and so your dvd is the only tuition I’ve had on mechanics/engineering. When working on the engines I had the dvd on the laptop and so repeatedly replayed each stage of the rebuild etc. There is no way I could have done the engines before and so a great thank you for the dvd and excellent advice. I have got the DVD, and it´s very good. But the man in the DVD shows us how to lift the heavy top part to get access to the hydraulics, and he usees some sort of home made bracket. You haven´t got some drawings of that bracket, with all dimensions, by any chanse? And the dimensions (positions of the holes and everything) of the plate on which a square rod was welded, too? to manufacture those part myself. But I would need all the dimensions. Hi Thomas, the scale drawings of the bracket for the hydraulic top cover removal are available here. I’m pleased to report that the DVD has arrived.. I had a look at the DVD and I’m very impressed with it. I think that you and Ian should be congratulated not only for this DVD but for all the help you give through your website to keep these great little tractors going. Just viewed my copy of the hydraulics DVD and I’m really impressed with it. I’m no expert when it comes to mechanical things but the DVD is clear and simple enough to even keep me right – can’t wait to get started on my TEF! Thanks and hopefully the engine DVD is not too far away! DVD delivered in good condition,very clear and informative, thanks. John. Hi, I have recently purchased your DVD and have stripped and totally re built my 23C engine, new valves and pistons Etc. I could not have done the job without it! It makes the job so easy. I have even enlarged the inlet ports. Roger. I salute you. 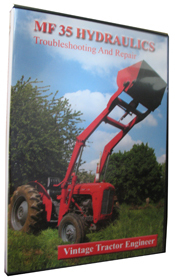 Yesterday I received your Massey Ferguson 35 Hydraulics DVD and I watched it. Everything is great OK. Thank you. Greetings, Danila from Romania. 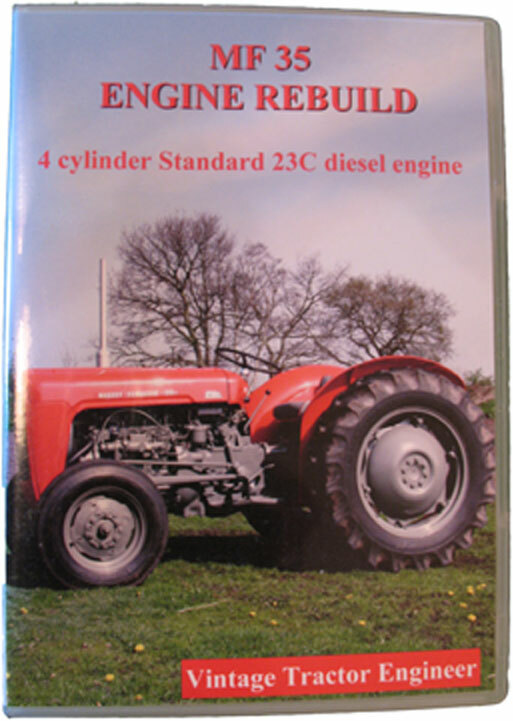 I have bought your DVD’s-the 35 engine overhaul -and the te 20 hydraulic overhaul and the 35 hydraulic overhaul -and I totally recomend them to anyone redoing their tractors. Hope you do more DVD’s in the future and will eagerly purchase them if so. Thanks a bunch Tom, Hanson’s Farm, Framinham, massachusets. 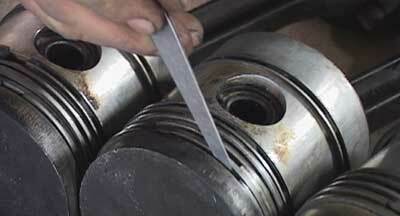 Hello, I have the 23C Engine Rebuild & MF 35 Hydraulics Repair DVDs, they’re great! Any chance you could do one for the 20C engine, the TE20/MF35/MF135 G/boxes including MP? I really enjoy the intelligent pace of the videos… Ian instructs very well and assumes correctly the level / ability of his audience… his style really suits me anyway! Best Regards, John Sweeney. Thanks, gave me the know how, brilliant! T. Harris. Hallo ,ich habe mein FE35 nach der DVD restauriert , es war Klasse , vielen dank für alles.